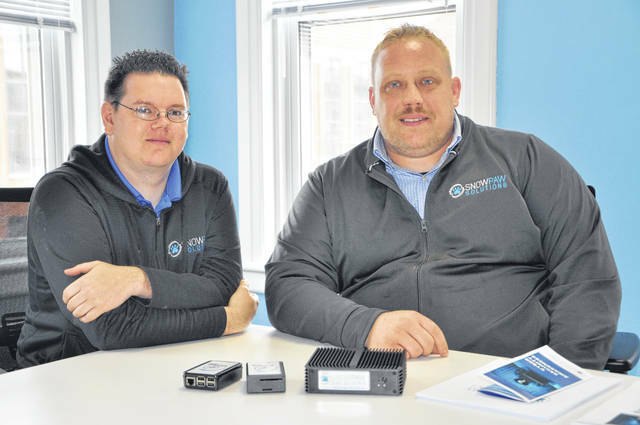 Rob Chaney, left, and Josh Johnson Sr., right, began SnowPaw Solutions in the spring to provide Delaware with education and defense against the increasing threat of cybersecurity breaches. Delaware’s historic downtown is full of small, locally owned shops and restaurants that represent the perfect blend of small-town feel and entrepreneurship. That blend isn’t confined to just downtown, however, as the ever-growing city continues to welcome new startups and small businesses all throughout town. The pleasant, unassuming nature of a growing, yet relatively small city such as Delaware, compared to Columbus or even larger cities, may allow for business owners to fall into a false sense of security when it comes to the most dangerous, and potentially crippling threat any business, no matter the size, will face: cybersecurity breaches. That’s where SnowPaw Solutions, a new cybersecurity business located at 2 Winter St., hopes it can make its mark on the city of Delaware. CEO Rob Chaney and COO Josh Johnson Sr. opened their office this spring as a branch of a larger company Johnson Sr. and his brother, Matt Johnson, started in Baltimore, Maryland, called Phalanx. Chaney and Johnson Sr. are looking to fill a void in the market for affordable business protection. Johnson Sr. said that servers themselves would cost businesses anywhere from $30,000 to $40,000 if a business even had room to install one. On top of the equipment, a business might have to pay as much as $15,000 simply for the service. In order to be able to make the idea of affordable security work, Johnson Sr. and his brother deduced they would need to develop their own equipment rather than sell other company’s products. First came the Trident CMP (Cybersecurity Monitoring Platform), which Johnson Sr. said basically replaces the bigger servers. About the size of a typical external hard drive, the CMP plugs into a company’s router and, according to Johnson Sr., will provide a window twice as big as mainstream products such as AlienVault and FireEye would. In addition to SnowPaw being able to see and access that information, so, too, can the business owners. To maximize affordability for the business, the hardware is provided to the customer free of charge. The customer only has to pay the service fee, which Johnson Sr. said is $399 per month for medium-sized businesses. He added the monthly fee for a smaller business can be as low as $199. In a world where cybersecurity attacks are becoming more and more common, protection for a business is of paramount importance. Ultimately, any business who scans credit or bank cards, or stores customer information, is responsible for the security of that data. A security breach falls on the business, and for a small- or medium-sized business, the fallout from a breach will often mean bankruptcy. The ever-increasing threat of cybersecurity breaches is led, in large part, by the evolution of the products and methods hackers now deploy to break into systems. “Today, we may be two steps ahead of hackers. Tomorrow, we could be five steps behind,” Johnson said of the evolving threat. That’s why the two believe simply providing access to affordable protection isn’t enough. Chaney said that even more so than the protection products themselves, what they have found Delaware really needs is cyber awareness education. Rather than throw a bunch of products at the consumer, the two hold as many cyber awareness classes as they can, all free, at the Delaware Chamber of Commerce. Johnson Sr. said they will try to have a class once a month, with the next one being held on July 12. “It’s not a sales meeting. We’re not trying to sell anything to anyone. We’re trying to offer free tips you can do to protect yourself at home and in your business,” Johnson Sr. said. SnowPaw Solutions wants to take the educational aspect a step further by creating a nonprofit “tech alliance” with schools that, through fundraisers and different events, will raise money that will be directly used to purchase and build technology for schools. “Anything we can do to increase the skillset with technology, we want to do, because that’s the world we’re in,” Johnson Sr. said. The SnowPaw brain trust encourages any and everyone to check out the free classes to learn more about the threats all residents face, be it in a business or even at home, and what they can do to defend against a cyber invasion. Those interested in learning more about the company and its services can call 740-833-6344.
https://www.delgazette.com/wp-content/uploads/sites/40/2018/06/web1_Bizz.jpgRob Chaney, left, and Josh Johnson Sr., right, began SnowPaw Solutions in the spring to provide Delaware with education and defense against the increasing threat of cybersecurity breaches.